This is our general body meeting. All Democrats are welcome! We’ll be talking about opportunities and challenges for 2019, including the upcoming municipal elections. Registration will begin at 10 am and all precinct Chairs are asked to be ready to provide an updated list of officers and members for your precinct. Thanks to all who have been working so diligently to prepare your precincts for the convention. If you have any questions, please let us know! Hope to see you next Saturday! 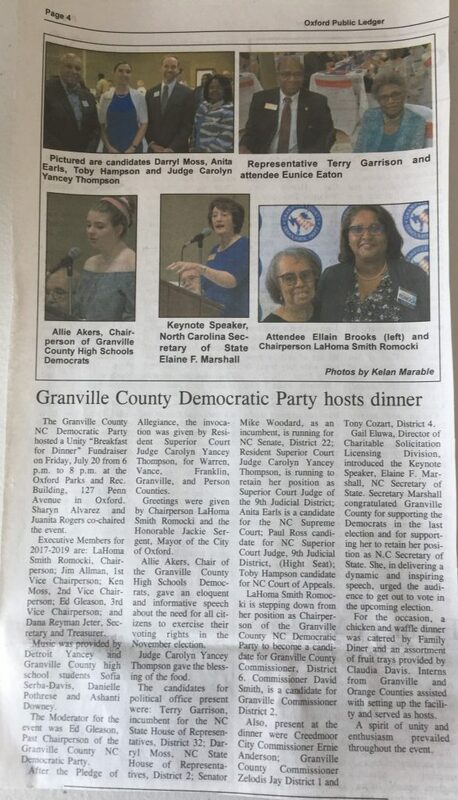 Change is coming for the Granville Dems in 2019! 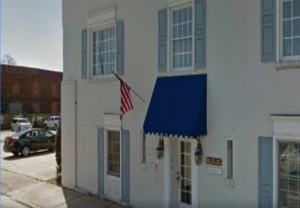 The Oxford office will remain open, but without regularly scheduled hours. Instead, we’re hoping to fill the calendar with meetings and other events of interest to Democrats. Do you have a group that’s focused on community needs and policy, or information you want to share with fellow Dems? Please share your ideas! 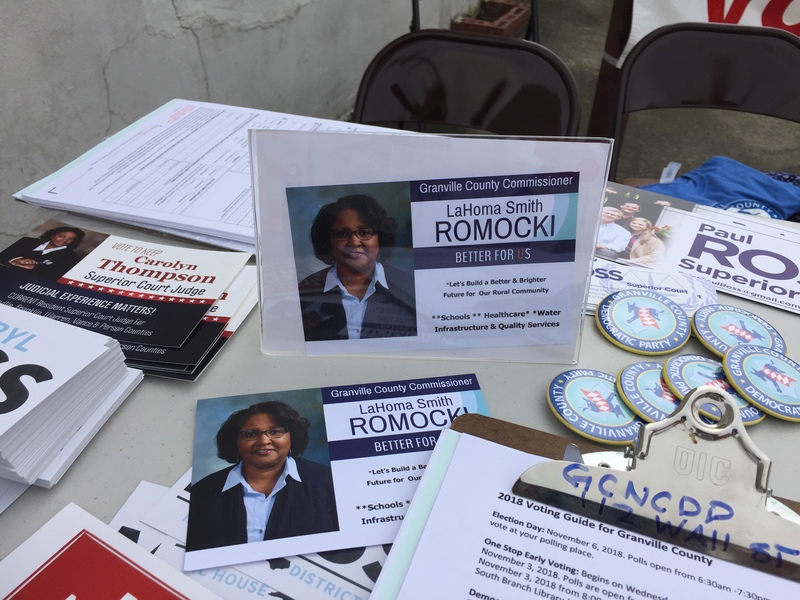 LaHoma Romocki has resumed her elected position as Chair of the Granville Dems, and Jim is back as 1st Vice Chair. Note that our two-year term will end in April 2019, when we will gather to elect a new Executive Committee. Would you (or someone you know) be willing to play a key role in this important building year? 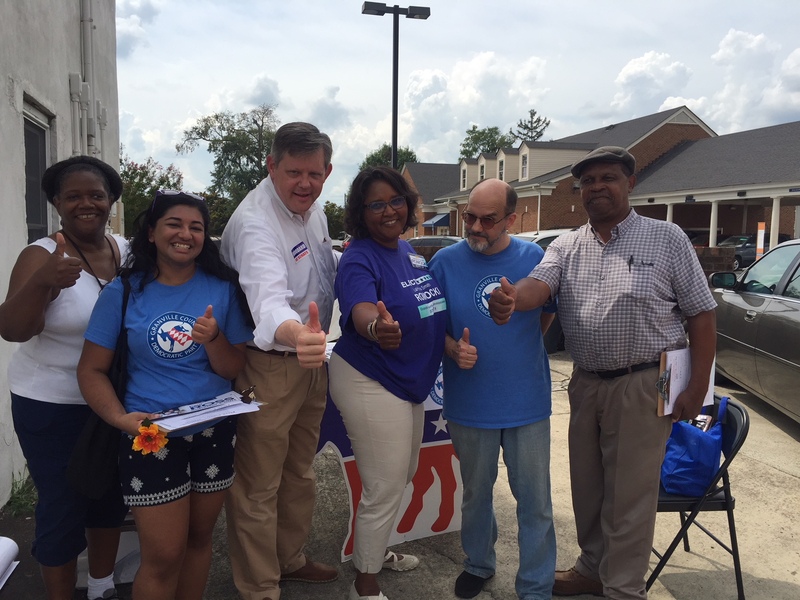 During the recent election, our poll greeters showed the power of organized precincts to bring help and resources right where we need them. 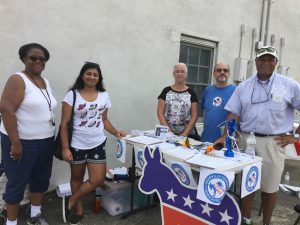 Now it’s back to organizing as many precincts as we can, so that we can educate and motivate Democrats throughout the county in 2020. Fellow Granville Democrats, it’s been my privilege to serve as your acting chair during this 2018 election season. After months of organizing and preparation, the NC Dems have succeeded in breaking the Republican supermajority in the NC legislature! This marks a turning point in stopping one-party rule in Raleigh and restoring free and fair elections. more places than I can count, and inspired all of our efforts. Now it’s time to catch our breath, document the lessons learned, and think about how we can stay engaged in the “off years” ahead. (By now, I hope we agree that there’s no such thing as an off year.) We need to stay engaged in local government and in service to our neighbors. I’ll have much more to say about that in a future post, but for now, let’s celebrate all that we’ve built and accomplished in 2018. 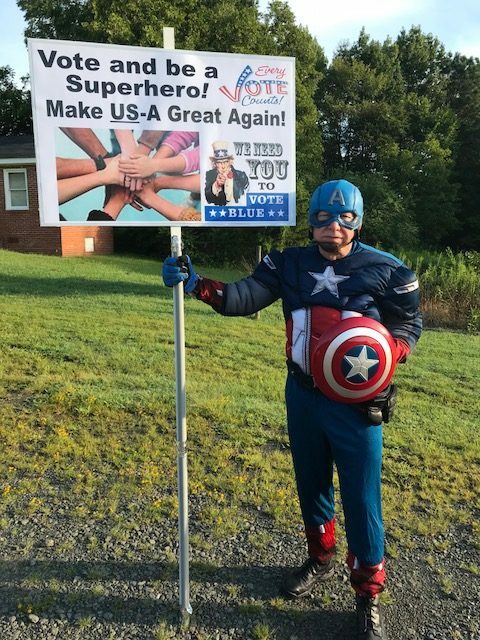 Last chance to get out the vote! Granville Democrats, please help us get out the vote! Let’s support our terrific Democratic candidates including Darryl Moss, LaHoma Romocki, and Judge Carolyn Thompson. Elections matter hugely — and, as you know, are often decided by just a few votes. Canvassing is the single most effective way to get voters to the polls. We knock on friendly doors to encourage Democratic voters, and let them know when, where and how to vote. Please join us! We will always send you out with a partner. Families are very welcome. Children of all ages enjoy it and are really a help! Tuesday, Nov 6 is Election Day! Canvassing all day beginning at 10am. Come when you can! Please write with any questions, or text 919-428-9082. Thanks to our volunteer events team! 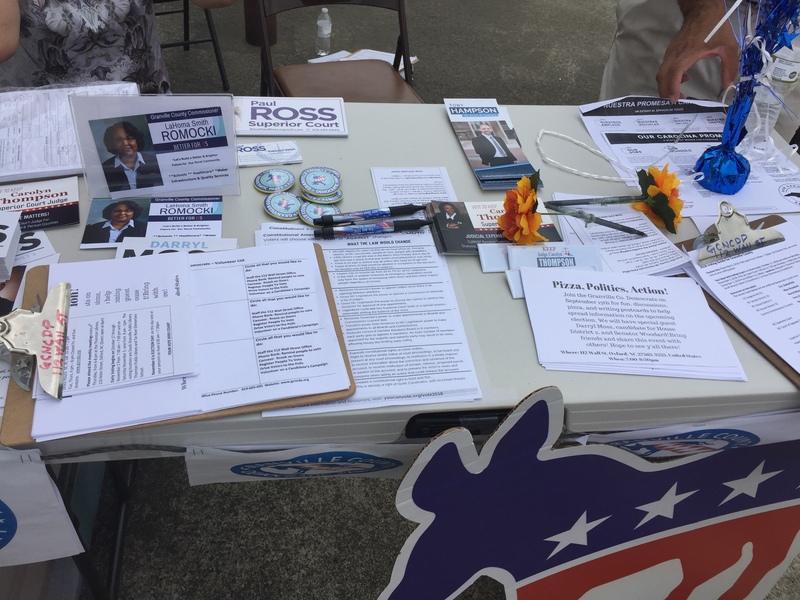 When you visit local gatherings and festivals, keep an eye out for Granville Dems. We’re out registering voters and sharing information about candidates and the Democratic platform. Below are some pictures of our volunteers at the recent NC Hot Sauce Festival. Watch the calendar for other upcoming events, including some that were postponed due to Hurricane Florence! And we can always use more volunteers, so let us know if you’re interested. Hi, all. The GCNCDP office in Oxford will be closed for a few days, just until the storm has passed. This week’s calendar events (local festivals) have been postponed, but once they’re rescheduled, our volunteers will be there! Stay safe, everyone. UPDATE: We will resume normal office hours today (Tuesday, Sept 18). Our 2018 Unity Dinner was a great success! Thanks to all who attended and whose planning and effort made it possible. Here’s a detailed write-up in the Aug. 9 Oxford Public Ledger (click for a closer look). We approved the Early Voting Plans today and they will be sent to the State for final approval. We will have 3 sites open and they will open on Wednesday (rather than Thursday). They will be open from 7:00 AM until 7:00 PM for 13 days and on the last Saturday, they will be open from 8:00 AM until 1:00 PM. The polls will open at 6:30 AM and close at 7:30 PM on Election Day. This schedule provides 3 ½ hours each day of extra hours for voting and also provides an additional day (Wednesday) that we have not previously been open. She also mentioned the challenge of staffing these locations with poll workers. This is satisfying work! If you’re interested, please contact the Granville County Board of Elections. 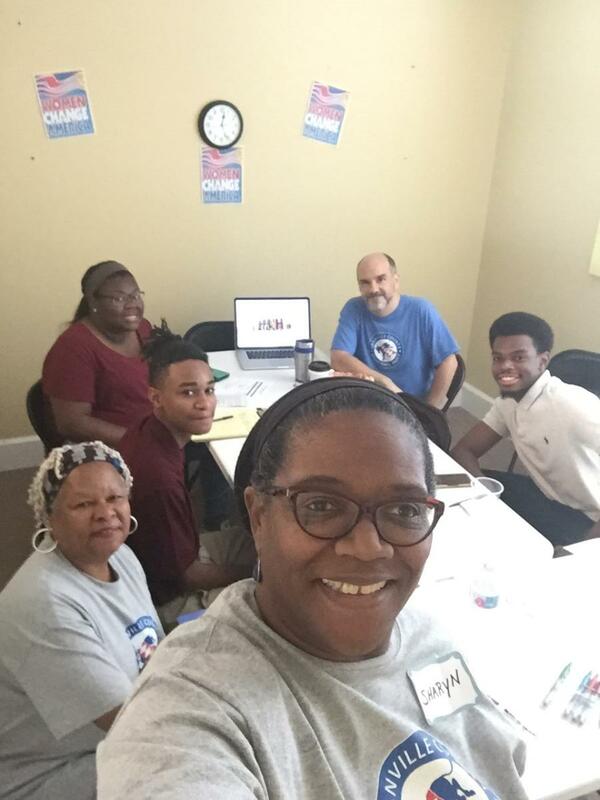 Sharyn (office manager) and Gloria (volunteer coordinator) with the interns. UPDATE: We are no longer accepting applications for summer internship. Thanks to all who applied, and congratulations to our new interns! 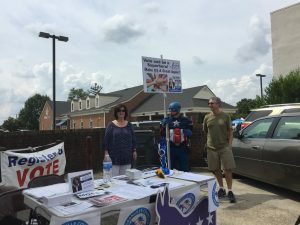 Description: The Granville County Democratic Party is seeking ambitious, hard-working and dependable students to support our campaign efforts. 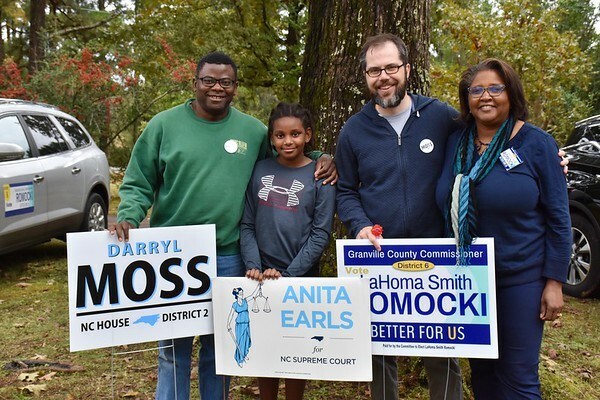 We are focused on addressing critical issues (schools, health, jobs) facing citizens in Granville County and throughout the state of North Carolina. Interns will have the opportunity to learn about these issues and gain a better understanding of how our political system works. They will also help support our daily operations and activities for the upcoming election. Can you choose your days and hours? Yes, Interns will sign up for a minimum of 10 hours per week each week. We will work with YOUR work, school and vacation schedules. We also have opportunities for evening and weekend hours. However, interns must show up when they are signed up to work. You MUST be reliable. What are the qualifications? To apply for an internship, you must be at least 16 years old and currently enrolled in high school, community college, or college. If you are excited about politics or just want to learn more about it, this is a great opportunity to see things “up close.” We are looking for people who want to do something DIFFERENT this summer that will help make a DIFFERENCE in the community. Where will I work? 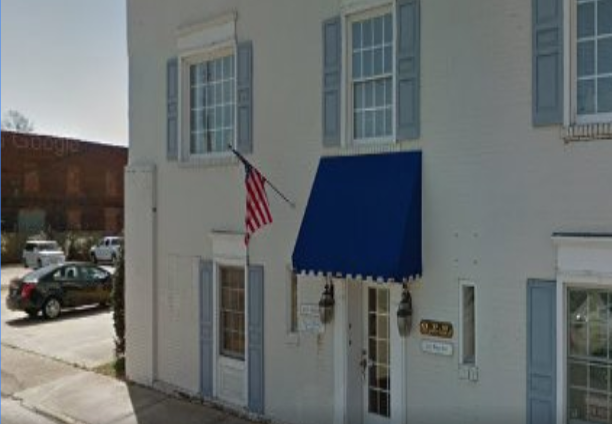 Most interns will work from our headquarters in downtown Oxford, however there will be activities that may take you out of the office during the internship. For more information, please call 919-528-4280. Click here to download an application. Must arrive by the deadline, Sunday, June 10, 2018, 5 pm.